In early January 2018, capitalists across the globe were celebrating the fact that the Dow Jones had rallied by 45% since the election of Donald Trump. Likewise, brokers were beaming in Sandton when the Johannesburg Stock Exchange hit a high of 61,475 points (up a staggering 300% compared to early 2009 when at one point it sat at 18,465 points). Yet beneath all the exuberance, danger signs abound—including signs that stock, bond and debt markets are experiencing bubbles, which will burst at some point. The danger derives from the reactions of the ruling classes and their states to the crisis of 2008. The paths they chose to follow to save and even further their own wealth in the aftermath of the 2008 crisis have paved the way for a future crash that could dwarf the one of a decade ago. 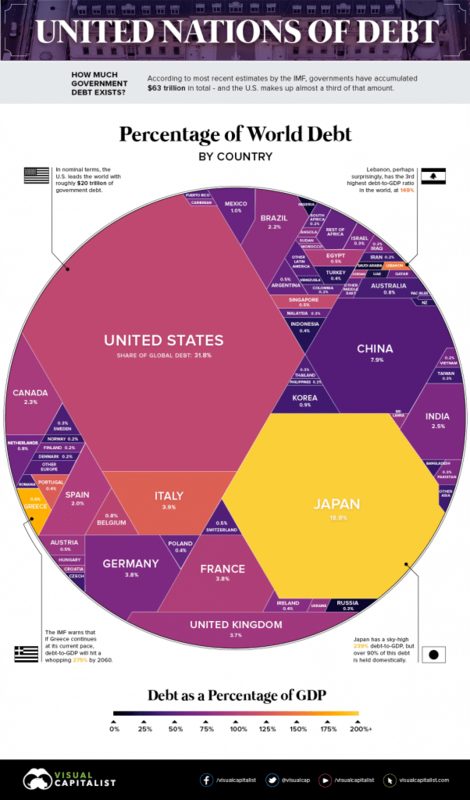 $63 Trillion of World Debt in One Visualization. Courtesy of: Visual Capitalist. In fact, the main thing currently keeping the global economy stumbling along—and not crashing down as happened in the 1930s—has been massive intervention by states in the EU, U.S. and China. Since 2008, as even Forbes magazine has pointed out, the U.S. state has spent trillions of dollars bailing out large corporations; many that were and are effectively bankrupt, whilst imposing austerity on the working class. This, at times, also saw states assisting corporations by taking on their bad debts and toxic assets—wracked up through wild bouts of speculation—by swapping this financial junk for government backed bonds. Quantitative Easing (QE) too has seen states assisting capitalists through creating money and handing to over to corporations. Far from using this money wisely, corporations have gone on a speculative binge, leading to souring stock markets. Bailouts and QE are not the only methods by which states have propped up an ailing capitalism. Low and in some cases even zero interest rates have been implemented by major states through their Central Banks to further assist corporations since 2008. For instance, for several years the U.S. state kept interest rates at zero; while states in the European Union have even had negative interest rates. Capitalism has become dependent on these low interest rates in the U.S. and EU, without it bankruptcies will proliferate. In fact, states find themselves in a bind. The main fear of the ruling classes that control states is inflation and rising wages for the working class–as rising wages slightly dent the vast sums of wealth being funneled up the class pyramid. To halt any inflationary pressure, the U.S. state has slowly and very cautiously been raising interest rates again. Should extremely low interest rates end, and be raised to levels even as low as 3%, thousands of businesses will go bankrupt in the U.S. alone. This is due to the reality that 12% of U.S. companies are no longer viable if interest rates even rise marginally. That is, their earnings do not cover their interest repayments, and an increase in rates by the U.S. state would propel them into bankruptcy, so dependent have they become on the continuous supply low interest and even negative interest money from states. According to a report by BofA Merrill Lynch, a similar picture exists in Europe, where 9% of companies are being described as “zombies”. The Trump regime has, of course, not deviated from the path of using the state to prop up capitalism; but has rather deepened it. The slashing of the tax rate to 15% has been another gift to corporations that will in the end total trillions of dollars. To fund all of these the bailouts, undertake Quantitative Easing, keep interest rates at record low levels, and fund tax breaks; states have issued bonds—in other words, they have taken on debt. The low interest rates have also seen corporations enormously increasing their debt. This, however, has not been used to invest in productive sectors, but has been used to speculate. This has seen large corporations once again borrowing to speculate on opaque derivatives, speculate on stock markets, and even speculate on fads such as bitcoin. As part and parcel of this, listed companies—from South Africa to the US—have been buying back their own shares to inflate the prices, which has in part fueled the growing stock market bubbles. In the U.S. alone listed corporations have spent U.S. $4 trillion since 2008 using the cheap and free money the state has given them to buy their own shares to boost the prices. The size of the debt problem is, therefore, massive. 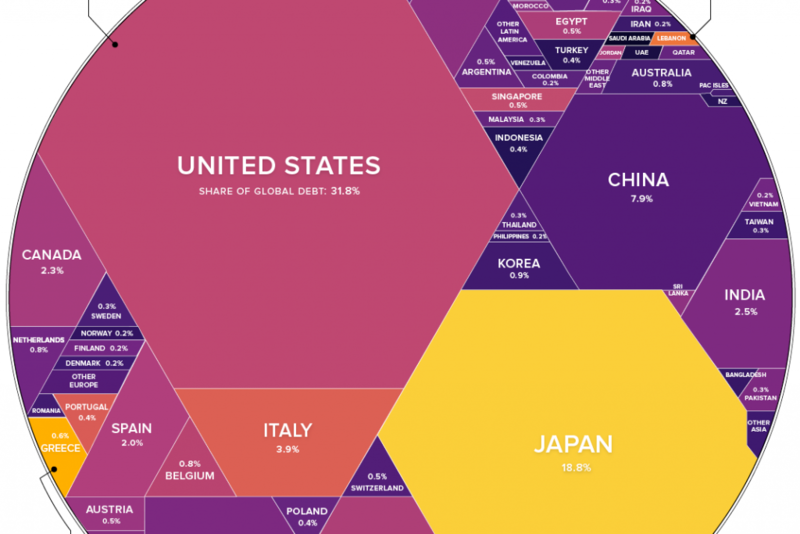 Global state and private debt has risen to over U.S. $233 trillion—300% the size of the planet’s Gross Domestic Product (GDP). Even China’s debt is beginning to pose problems as it stands at over 260%. Under such circumstance, it is not a matter of if the bubbles end; but rather when. When these do burst the states that have been pumping money into the financial sector may find themselves with few tools left in the box to avert a massive crisis. Given state’s already have vast debts and are already the main purchasers of their own bonds, adding further massive amounts of debt to bailout corporations when the bubbles burst may not be an option. Likewise, states are being forced in the current context to gradually raise interest rates, rather than reduce them—which they used as one mechanism to assist corporations in the crash of 2008. The bad news for the ruling class; their states and companies (and possibly everyone including the working class), therefore, is that they are running out of space to maneuver and they are running out of time. When the crash does become a reality, the political and social consequences will be chaotic and very uncertain. Given the fact that the working class internationally is weak, further shifts to the right and even fascism could be a real outcome. Trump and his cabinet could only be the start of dreadful reactionary politics worldwide that could make the already horrendous neoliberalism of the 1990s and early 2000s seem humane. If the working class is to prevent this, it needs desperately to revive revolutionary politics in opposition to the ruling classes, their states and capitalism. Capitalism won’t end because of a future crisis, but if the working class can’t build a counter-power it will pay during dearly when it happens.